I live on Long Island and am open to co-creating an event here with others of like mind. If you live on or near Long Island and would like to participate in, or help organize, a direct action event against the telecom industry on Earth Day, please email birthofanewearth@startmail.com. Together, we can help put a stop to this genocidal assault and the roll-out of any further radiation-emitting technologies. The time is now. Let’s do this. Let’s get real- the telecom industry and the FCC have declared war against us, and we need to get serious about fighting back, and get a lot more radical, if we have a chance of winning this war and foiling (pun intended) their plans. 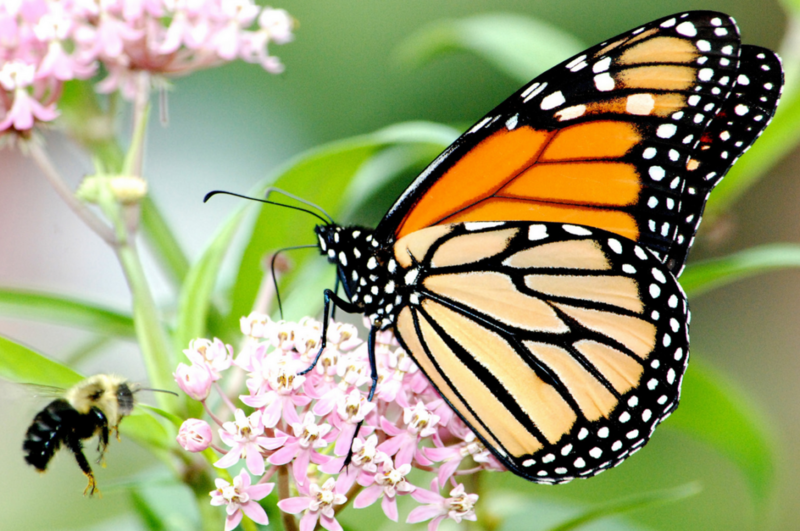 Butterflies, bees, and other insects are being destroyed by wireless radiation and other causes. A few of us were discussing the possibility of commemorating Earth Day (Tuesday, April 22nd) this year by launching a day of action against the telecom industry, highlighting the enormous damage being done by telecom to the natural world through irradiation and greenhouse gas emissions. There is power in having a linked day of action to show the breadth of resistance across the country, and particularly in getting people in smaller communities the confidence to stand up and demand change. In 2014, our network organized an “Action Day to Stop Smart Meters” together with a website, support materials, and press releases. There were more than 30 different protests on that day and we posted photos of each on the website. 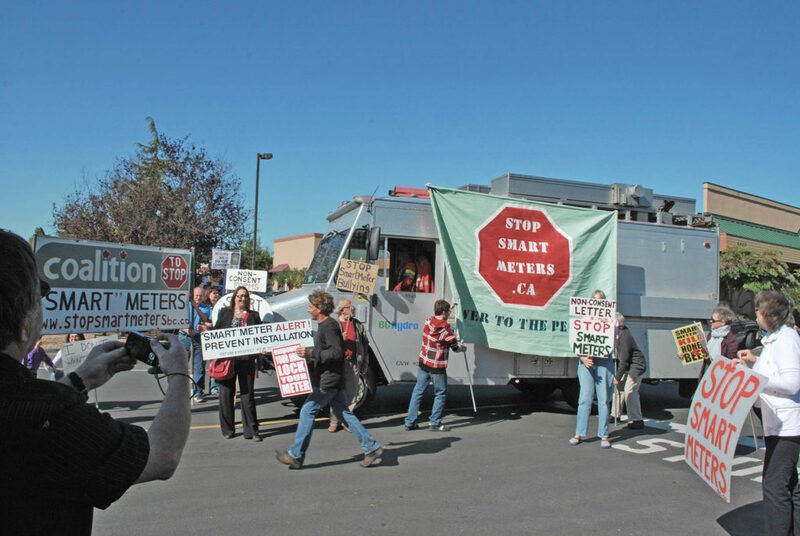 BC Activists block utility vans during Action Day to Stop Smart Meters in October 2014. There were even some disruptive protests, and this made waves and generated press coverage that helped galvanize public awareness of the seriousness of this issue. 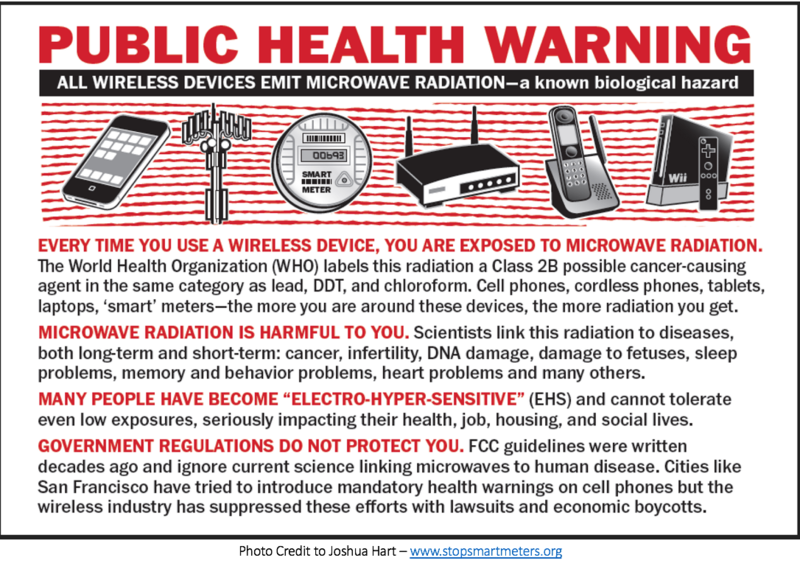 Now life on our planet faces an existential threat from internet satellites, millions of new 5G antennas, and more 4G towers being forced into previously low EMF rural areas. No one who has worked on this issue in any serious way for any length of time can doubt that the government agencies who regulate telecom are corrupted and owned by the industry they pretend to regulate. They don’t care if they violate the law or even kill you (or the whole planet). But yet we continue to focus 90% of our efforts to “persuade” these corrupt institutions, when the public has the ability to stop this holocaust directly, if we only realized our strength. 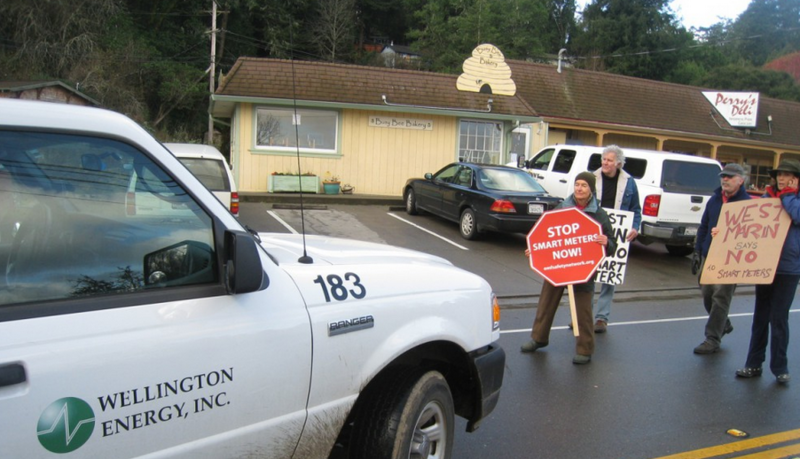 Our network has promoted and assisted in communities taking direct action to stop wireless proliferation since 2010. Watch the video here. 3. Organize a group and disrupt an Apple/ Verizon/ ATT store etc. – when we did this at the Verizon store in 2014 in San Francisco they did NOT call the police because they do not want headlines about the health risks of their technology. (risk of arrest- low if you leave when (and if) the police arrive, medium if not. Max sentence- misdemeanor trespassing, small fine, maybe a couple of hours in jail). 6. Some have remediated/ mitigated existing WTF’s (risk of arrest- high if caught, possible prison sentence). Watch new Icelandic film “Woman at War” for inspiration. Though we are not encouraging you to carry out such potential acts, we also refuse to condemn them. There is one month left until Earth Day. If we push this full throttle, we could dominate headlines and change the narrative around the 5G project- linking it with climate changeand species extinctions. With any effort like this, it will require brave people to take these actions, and to open a space in society where policy progress can be made. No major movement that has challenged the powers-that-be (and especially a trillion dollar international industry) has succeeded without a potent show of civil disobedience and public unrest. If everyone is polite and restrained, many will assume this issue is not that big a deal! Taking direct action changes the power dynamics, and forces the industry to respond to our narrative rather than the other way around- strategically crucial to make our eventual (and inevitable) victory that much sooner. We look forward to taking action with you to make our communities safer this Earth Day, April 22nd 2019.